[If ever you observed what appears to be 2 d force sources opposing each--it's illusion. Cannot have two such legs of a triad. Instantly cancel each other. TASK: Consider: how does anything become a "fact" (i.e., accepted, unopposed common knowledge)? Discount the immediate yellow circuit answer. ][Valentine Gift: Man in part is a physical manifestation (literally) of Life talking to itself. For as long as civilization has existed on this planet, men have debated and attempted to investigate the human condition on the basis of Man having a psychological side and physical side. That is, Man considers his mental functions or personality to be one thing and his body to be something else. Life is beginning to speak through many voices now about the possibility of a connection between these two apparent parts of man, but many of you, without being aware of it, have far surpassed the outstanding figures of contemporary psychology because you have already had quite firm glimpses on your own that this division between mind and body does not exist. The ongoing belief in such a division is due to the nature of the functioning of the Yellow Circuit itself. I have been using the terms "who-people" and "what-people" in some of my discussions of late, and for the time being I find favor with the terms and will continue to use them, but until I decide to change them, I want to remind you again that my use of the words is in no way demeaning. I have been referring to ordinary people as what-people, but remember that everyone is a what-person from Line level down. In no way is this a demeaning attack on humanity and in no way am I setting myself up as being superior. Different, yes, but one of the reasons I started using that term is that ordinary consciousness itself, in an ordinary person, has nothing to compare itself to. It believes, as it is supposed to, that it is endowed with all those great manifestations -- free will, conscious behavior, separation from the environment. It believes it is a "who." As all of you know, ordinary consciousness believes that it is a "something," a noun. I recently received a note from one of you dealing with an observation he made at one of the public presentations. The observation concerned this person's perception that some of the things you people had written for the presentation seemed in some way to be talking down to the public. It is quite reasonable to expect that in your ordinary circuitry, some of you would think you heard that, and some of you in your ordinary circuitry would be inclined to present that sort of attitude. But by beginning to expand your own circuitry, your own consciousness, it is not that you have in some way become superior. Least you find yourselves entertaining such voices internally, can you play the role of my fictitious, reasonably insane man and ask yourself what specific, individual efforts, what specific plans brought you here? How is it that you're responsible for us finally crossing paths? And out of all the people that have come and gone from here, how do you take credit for you still being here? How are you superior? I want you to understand that my use of terms such as "what-people" is not an indication that someone doing This Thing is superior. You are obviously becoming more and more different, but when I use a term such as what-people I am not referring to men as dumb, blind machines. Men are living connections and transfer points, and to some degree, everyone is always tied to Life's Grid, no matter if he reaches the highest possible level in this lifetime, expanding his awareness, his nervous system into tomorrow. I don't mean this in some theoretical way. You are always, to some degree, a what-person. But the difference is this: at the level of ordinary consciousness, everyone believes that they are a who-person, and until you begin to see things on your own, you cannot understand that the thing which calls itself a who-person is not. In the beginning, the closest you can come to becoming a real who-person is to be able to refrain from being a what-person. Throughout history, through various religions and cults, there have been continuing stories reflecting a belief in a lost homeland. Consider how comforting these stories have been. And beyond the larger stories of tribes or whole nations seeking their lost homes, consider too, on the individual level, the stories of wandering mystics traveling the face of the earth seeking some great secret. I say that these stories are comforting on the basis that, at the ordinary level, Life is talking through men, making them have this feeling that in some way, deliverance will come. Men believe if they follow a certain teaching and live by certain rules and standards, they will at the very least upon their death be delivered into this lost homeland. From the standpoint of someone attempting to make great changes within himself, it is comforting because it requires no effort. Man believes that at the bottom line, he will be delivered. Another way that you should try to consider this individually is that the lost homeland idea is under the almost total sway of the D flow. It is regressive, almost always accompanied by the notion that Man has been thrown out of paradise due to some failure of his group, his tribe, his religion. He believes that he has transgressed and must somehow find his way back to his homeland. This is another of those beautiful areas for your further Neuralization, and I am not going to dwell on it. But if you can see quickly, on one level, it will strike ordinary consciousness that the idea of the lost homeland is somehow beneficial, and you can feel your own circuitry respond to it and vibrate with it. It is comforting in the ordinary circuits to think that there is a lost homeland we can return to, but if you can truly see it, there is a contradiction. It is D force. It sounds as though it's talking about the future, but it is not in any positive manner. As I tried to indicate last week, it can sound as though it's in favor of change but it reflects a desire to have things go back the way they were. It is regressive in that there is no change, no profitable alteration in circumstance. It is an enactment of D Flow's responsibility to help stabilize an inherently unstable condition, to keep things rocking back and forth and, at the same time, moving forward. So it is that what seems to be tied to the future is really regressive. You can see in your own circuitry how pleasant it would be if I could force you or somehow allow you to believe there is in fact a lost homeland, and what man has always thought of as paradise, or being more awakened or more conscious, lies down the horizontal line of time. All you've got to do is feel the what-person in you respond, "I knew it, what a relief. What goes around, comes around -- we will be delivered." The comfort lies in the belief that paradise does exist, that the structure is already known, so all we have to do is get back there and it will be waiting for us. But it's not. Paradise is yet to be formed and that is not comforting. Another story continually pops up throughout recorded history. The better known examples usually involve a great temple, but all the versions of the story from the various cultures apparently involve a huge building or structure of some sort which seems to be incapable of being completed. The people work on it for generation after generation, but something always seems to happen to prevent it from being completed. But the great temples in the stories were always assumed to constitute some sort of final statement, the final praise of men for the gods, the final, ultimate connection between Man's handiwork on this level and the gods' on some other level. But the buildings never seemed to be completed. I could add to the story for you, give some parts of the story which were not included in the original version. Like along the way, while the building was under construction, some people began to ask questions: "What was the original motivation for this structure? Where are the plans and why do we seem to keep working on it piecemeal? Why are there reports that a generation ago it was even closer to completion than it is now?" And as these unsettling sentiments began to sweep through the laborers, some wise old man said, "Well, now that you ask, there are still in existence descriptions of the original motivation to construct this temple. The full plans are here. They've been passed along and I have them in this book, so we have not been flying blind. These plans have been passed along a certain line of command, a certain line of authority, and I am the contemporary recipient, the holder of this sacred trust." Then one night a couple of smart-alecks got drunk and beat the old man up and looked in the book and it was blank. That's the part they didn't throw into those old stories and I guess you can see why. Sometime back, a group of us were sitting around and I mentioned something else, something that we could do on a more public level. At the time it came to me, the name for this thing was "The Project." we could start if we had 8 or 10 acres of land somewhere, by putting up a fence around the site, a solid wooden fence, maybe 6 feet high. There would be one entrance through the fence and over it a sign: "The Project." For several months, trucks would be seen going in and out of the fenced area, and clouds of dust would rise up. And then one day you would begin to be able to see part of an aluminum or stainless steel structure visible above the fence. Maybe it would look like the beginnings of a rocket ship or perhaps just a large cylinder, but still the trucks would be seen coming in and out and people would show up for work every day and would knock off and go home every evening. And this would go on for several more months until 2 or 3 feet of the structure was visible above the fence. Then suddenly, over one weekend, the fence would get built up higher to hide the structure. Then 2 or 3 weeks later the structure would rise above the fence again. When I spoke of this before, I did not go into it any further than I have just now, but it struck the people at that time, much as it's striking some of you now, that there is something that could be done with this idea. It seems there is something people could learn from it. There would be no problem getting publicity if you had a good location; The Project would get written up in the papers just from people driving by. People would wonder, "What is going on? What is 'The Project?' Nobody will talk, they won't let reporters in, and the fence keeps getting higher and higher, the structure gets larger and larger. And there's never any explanation." It seems as though there is a great story here, a great potential teaching lesson. But let me point out something (and this gets close to something very tricky, it gets down to the nerve endings of one part of Life). Let's assume we had the financial wherewithal to actually do such a project. It would strike all of you that for some length of time it would be an intriguing undertaking, that it just smells of something. But there is an undiscovered correlation between scale and tempo, and I'm using "tempo" as a slightly four-dimensionalized reality behind the ordinary conception of time. If a thing is too large, it cannot be properly digested in a timely fashion and hence, things such as The Project I have described would be almost impossible to digest by those who might get something from it. Rather than do The Project as I have described, it would be more apropos to condense all of it into a written report as though it had already happened. There is a difference between an actual occurrence and a verbal or literal description of the event. Consider all the stories you have read of the great mystical teachers and religious figures of history. Despite any dreams you may have once had in your ordinary consciousness about what it would have been like to have met these people and lived with them, can you see how different your impressions would have been of them had you met them personally, as opposed to the impressions you received from reading about them? Can you glimpse what I'm pointing at? There is some undiscovered correlation between size, scale and the tempo of movement of something as it relates to one person's life. But it is something completely different to have a written report. It could be a verbal report, through the telling of tales, but in contemporary times it is almost required that it be in written form. If it's not written down, it's almost as though it didn't happen. Whether it be a report on some famous person's life or on some project that had an impact on humanity at some time, a written condensation of an event, whether the event actually happened or not, is a different thing entirely from the actual occurrence, and the condensation is more digestible. For example, I could place ads in all the mystical magazines, in the newspapers of all the great cities of the U.S., describing "The Project" that was about to start. The ads could include descriptions of The Project, with photographs of the fence and the stainless steel structure, and warnings that no one would be told what was actually going on, and that only those of great mystical commitment would be allowed to participate in this great work. Suffice it to say, little more would be needed to appeal to a great many people, people who would want to move here and become part of whatever was going on. There would be a great difference if I were to merely write up a book or pamphlet and distribute it, describing The Project as something that happened at some time in the past, preferably at least 10 years ago. Don't just consider how this might affect other people, Neuralize your own what-person, from Line level down, as to what it would be like to get a report of how The Project had happened, with photographs and descriptions of all the people who moved here to work on it. Consider what would seem to be the great mystical lessons you could learn from sitting there reading about it, as opposed to you going there to take part in it. When the correlation between scale and tempo of a thing is too diverse, it's almost as though the thing does not exist. While this may sound easy to comprehend verbally, there is a reality to it that is of extreme moment to moment pertinence. This is in part connected to what I recently labeled as the Tempo Spectrum wherein, within ordinary consciousness, there are things that are happening so slowly, such as mountains growing, that you cannot see them. And likewise, there are things, for example on the subatomic level, that are moving too fast for you to see. When I first described this to you, I was trying to get you to consider it simply in the light that things may move too fast or too slowly for you to be aware of them, but a further refinement of the map involves scale. It is true that a thing's speed affects whether or not you can see it, but so does its size. Ordinary consciousness seems to ofttimes be enamored with wanting to discuss events that are of such a scale that an individual man, even at the extremes of the who-person illusion, could not believe that he could affect them, e.g., international banking, or the political struggles between nations. Many people feel driven to write letters to the newspapers and call in to talk shows to discuss what could be done to stop wars in third world countries. If you could take one of those letter writers or talk show callers, and wrestle them to the floor, you could probably get them to admit that one person couldn't have any effect on such events. But they would continue to have an interest in such subjects. The Yellow Circuit is driven in this way. The Yellow Circuit is the point at which Life is exerting itself and the strongest C flow through humanity. But it is operating at such a tempo and scale that even ordinary consciousness cannot believe it can effect what's going on. Yet ordinary consciousness continues to talk about it. From one viewpoint, these ordinary people may as well be talking about being picked up by flying saucers, or about their theories of why the earth is flat, or other mystical hocus-pocus. From one viewpoint, the living epitome of unreasonable, unbridled imagination is people discussing events that are either too large, too small, too slow, or too fast for them to have any possible effect on them. In fact they cannot even see them, and yet the Yellow Circuit apparently has some notion of them and discusses them. Let me see if I can stretch your awareness from another direction. In my erstwhile symbol of the nervous system, with the large circle representing the brain and the line that I draw through it representing the Line of consciousness, it is self- evident that the drawing does not equate to you as a person. You are not a flat something and there is no line running through you even though I told you there was one and I could see it. There is no line running through you like the one drawn here because you are not a circle drawn on a piece of paper. Although it will hurt what-person heads, you should be able now to try to expand what I have been referring to as the Line of consciousness into a 3-D outline. In one of my previous drawings of the circuitry, the Red, the Blue, and the Yellow Circuits were interlaced in such a way that all three passed through each other. There is a basis to this map; it's not 2 dimensional, it's not even limited to 3 dimensions, but the map represents the reality of how Life expands in Man. It represents the absolute reality of the kind of process that each person goes through in growing up and reaching the adult state of ordinary consciousness. It represents the conscious outline of a man, but within the outline are areas wherein the Red Circuit is most easily felt and seen (if you could see it). And there are places where the Blue and the Yellow Circuits are most prominent. Again, it's not just a 2 dimensional outline around a person, it's as if it were a shroud around you. But there are places where the Red Circuit, in a sense, had its origins, where its lessons were learned, and where it plays the predominate role in this (at least) 3-dimensional outline around you. And these different circuits, these varying areas of the outline, perceive different parts of the tempo spectrum. I guess some of you will begin to wonder if this has anything to do with the idea of auras and other mystical-type things, so you can wonder if you want. But there are places in this outline that you can feel within yourself and you can see them in others. It becomes obvious where the Red outline has expanded and plays the most predominant part in the outline of your total consciousness. And there are areas in which it appears that the Blue has formed and is mostly in charge and likewise the Yellow Circuit, but each of these areas perceives a different part of the tempo spectrum. This is not true literally, because it is not limited to this; I am trying to get you to Neuralize something. But the Red Circuit, for example, not only perceives things in a limited tempo range, but also a limited part of the scale spectrum as well. Each of the circuits has the ability to see one area within that total spectrum more clearly than the others. The circuits touch, there is overlapping, but if you would begin to Neuralize this you would begin to have some additional insight into the tales such as the Tower of Babel, and into why some people seem to have no patience. We are talking as though people were who-people, but it explains why some people are apparently always anxious to do something, and others when confronted with a question or a problem will just talk it to death. These two basic types of who-people, the impatient and the procrastinators, would from one viewpoint seem to be at loggerheads. One type might say that the other is a hothead, that he's going to ruin things by failing to plan ahead. And the other party views the first as being unprofitably willing to discuss the pros and cons of a question until it's too late to do anything about it -- "He's willing to sit and discuss whether or not the sun is going to go down until you sweat bullets." Both consider the other to be unreasonable. But now Consider what I am saying. The circuits, in their own I-sight, primarily perceive only one area of the spectrum. Each circuit has its sense of awareness in a different area of the tempo spectrum, so from its viewpoint it is not killing time, it is not dragging its feet. Nor is it rushing about, blundering its way through delicate situations with insufficient consideration. It is doing things at exactly the right tempo. A person who is driven by the Red Circuit is not deluded as a more Yellow Circuit oriented person might believe, he is not without the ability to think things through, he is not rushing into things, for the speed at which he operates is the speed at which the Red Circuit receives information and is motivated to act. If you recall, I have told you on more than one occasion: That which is too drastic is not true. All of you believe you heard a little piece of something when I went into this before so let me touch on it again. I pointed out to you that the so-called great inventions of Man didn't just happen overnight. The basic physical laws of flight were known for 5 or 6 hundred years -- in a sense, 5 or 6 hundred years too early. It just wasn't time for men to fly. You could describe it from a more horizontal viewpoint and say, "Well, they understood the theory of flight, but they didn't have the reciprocating engine, they didn't have the proper means of powering a vehicle to allow it to get off the ground." All right, that's true, but if you look at it another way, it was simply not the right time. The electric light was not invented in one day. Thomas Edison fooled around for ten or fifteen years before he finally got the right element. The theory necessary for the light bulb was several hundred years old. But the time was not right. It was too drastic. In regard to This, the reality behind what I tell you people is too drastic. I water it down. I've never told you this but I'll go ahead and throw it in even though it makes no sense -- sometimes I have to refuse to think about what I'm telling you. I have to take that which is too drastic and gradually make it fit. What you're beginning to do on your own, to give it a verbal description, is take the things you're beginning to see and make them fit into the outline of your consciousness. As you see these things, you realize they have no name; you realize, "I'm seeing this, as far as I'm concerned, as a virgin. No one I know has ever seen this strange occurrence before." Un-ordinary perceptions connect together to form a living nexus but you've got to make them fit your outline of consciousness. If you can't make them fit, if they are too drastic, you're stuck with a variation of my old story about the gods coming down to Cleveland -- the god steps out of his flying saucer and says, "God is love." And everyone standing there says, "I knew it, I knew it." He has to say something like that because if he said anything really drastic, the response would be, "That was crazy, what did he say? What a waste of time." At the ordinary level, if something is too drastic, it's not true. But to properly feed This Thing everything must always be on the verge, right at the very edge of being too drastic or it is of no value. Because if it is not approaching that level, you're entertaining thoughts you've already thought before. And repetitiveness is sin; you're going nowhere. You must be constantly pushing. Driving down the street, you might look up and wonder who came up with the idea of traffic lights, of how marvelous they are. What did they do before they had traffic lights? Did traffic lights exist before they had cars? Did people need cars before they had traffic lights? Did they invent automobiles before they had highways? I am not going to give you an end to this line of questioning because to do so would kill the general thrust of what Neuralizing is. All of your voices, everything that is going on in the outline of your circuits -- "God is love. People that drive beat up old cars can't be trusted. Rich people would ruin everything if they had more power," -- the immediate knowledge that your circuitry possesses, it's all worthless. The whole outline of consciousness around you, in toto, in all dimensions, anything your circuitry can run through is absolutely worthless. It's not a question of whether or not the things the circuitry says are true or not, for down at that level there is no "true or not." The circuits just say things. They pass along energy. And everything they say is tied to the past, because they can never break from the past in a drastic manner. Your circuitry lives what you apparently picked up from your parents or peers. Of course, don't ever forget that there is no environment -- everything is heredity -- but your circuitry is tied to your past experiences and there is a sense of continuity to all of it. On the ordinary level it doesn't matter whether or not your thoughts and opinions are true or false. Literally, they are meaningless. If your circuits have a certain perception of a given situation, then for you that perception is true. There are other people who see it that way too; and then there are people who hold opposing positions. But it is not a matter of any of those positions being right or wrong. They are useless. They serve the continuing purpose of transferring energy for Life. This is the basic, inescapable position that everyone is tied to at the what-person level. You are going to pass energy. That is the basic requirement and purpose of humanity. You must see this for yourself, though. You must be able to take that which is too drastic and gradually fit it into your outline. That is what all of you are up to here. And at those times when you trip, you go ahead and be a what-person for a few seconds or a few minutes, even if you weren't aware of it at the time, other people here were aware of it; for it's all connected. It helps keep a kind of check and balance, and the more you do it, the more you can smell it in yourself. I recently spoke to you about an aspect of the Straight Line phenomenon wherein people seem to have induced dreams of certain changes in circumstances producing direct, linear changes in their lives. The example I gave was a man believing that if he could have a new Corvette, all paid for, his life would move in a straight line from point A to a point labeled "extreme pleasure." I want to give you a very useful connection between this idea and the reality of Triads. This should strike some of you very strongly. Things -- nouns -- are not functional legs of triads. They simply are not. This has nothing to do with morals or religion, but everything to do with physical, total Triaxial Reality. Things, whether they be Corvettes, books, religious ideas, or a church building, cannot support a leg of a triad. Only living processes can. There is no exception to this. I am giving you an absolute rule, no thing is a functional leg of a triad. And thus, if you follow, this is another reason why a new Corvette will not equal happiness. With the right kind of effort you should be able to see this on your own, even though your circuits will tell you it is not true. 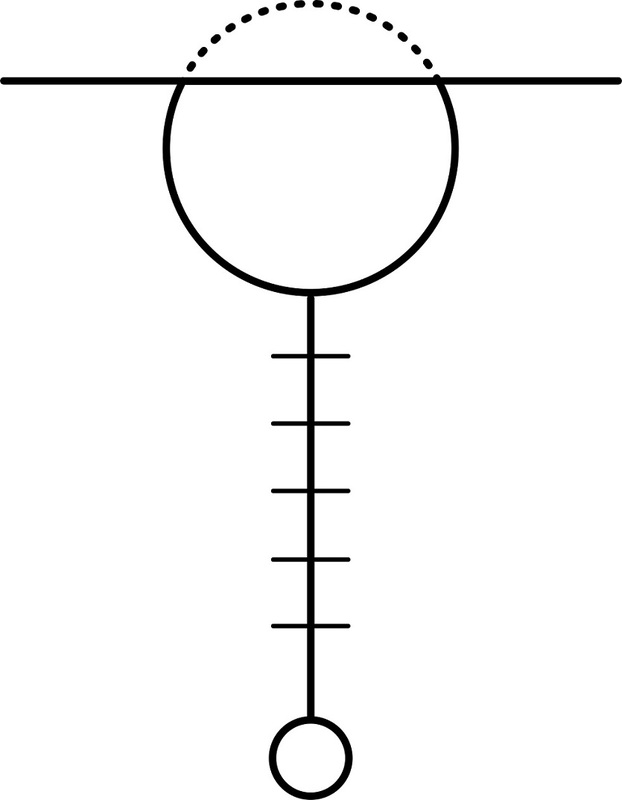 The Yellow Circuit, due to reasons connected with the fact that it talks about everything, assumes that things will support a triad, or at least that things should support a triad. But they do not. Only a verb, only a living process can be part of a Triad. There is no possible Triad that you can come up with that would have a thing as a functional support on any of the legs. Associated with this is the ordinary misperception that nouns play a functional role in triads. I once pointed at this in my example of a dog not knowing what dog food is unless he is hungry. When he is hungry, food is a verb, not a noun. If he is not hungry, it's not even worthy of debate whether or not he even sees food sitting in his bowl. Just look at what happens. If a dog is not hungry, you could just as well fill his bowl with shredded newspaper, copies of presidential campaign speeches, or "Have a nice day" buttons because if he is not hungry, he is not going to engage in the process/verb of eating. The food is irrelevant. It does not exist. It is not a part of a Triad to him, if dogs had Triads. By the same token, when someone's circuitry says, "If only I had a new Corvette -- if I had this thing, it would equal happiness," they are not actually talking about a car. But the Yellow Circuit cannot hold that awareness. The Yellow Circuit believes it is talking about a car. It believes that if it had the car, the thing, it would have the leg of a new triad, and things would shift over into an area of increased pleasure. But the thing wouldn't do it. What the Yellow Circuit is talking about is the process of "me" in the car. "Me" in the car and then all those beautiful women saying, "Wow, he sure is ugly but that car makes up for a lot." There is a certain process going on at the ordinary level. It is not a curse, there is nothing wrong; but in a sense, Life is set up to be a continual series of low-level disappointments -- "I slaved, I stole, I embezzled and I finally bought that car. It seemed like a big thrill for about a week and then it was just a piece of junk, just another thing, another possession." It is because no thing will support a triad. Things are not pieces of triads. If you listen to your internal voices, they are continually talking about nouns, about things: "If only I could bring this thing into my life, into my occupation, into my social life, it would greatly alter my experience of Life, my experience of myself," but it will not. It cannot. Things cannot operate as legs of a triad, only processes can. A triad is composed only of moving parts, and a Corvette does not move. A diploma on the wall does not move. What the circuitry is unknowingly talking about is not the thing, but the process that would be involved if "I" had the thing. The circuitry cannot be aware of this, it cannot differentiate between the things and the processes. So life is, as it should be with ordinary people, a continuing string of little disappointments for fifty or sixty years: "I work hard to get something, and then it's 'So what?' It's the nature of Life." There is a reason for it. It's not a curse; it's not the gods saying, "If you're going to pursue a life of materialistic pleasures, I'm going to get even with you. You're going to be miserable, even if you get a new car every year. You can even have an old car every year and you're still going to be miserable; it doesn't matter." It's not a moral or religious reason, it's not some mistake on your part as a who-person. It is because things will not support a triad; they are not in any way, shape, or form a leg of a triad. If they could be it would only kill the triad, because "whats" are dead. Only processes can do it. That's why a Triad continues to move. That's why Life continues to move. There's another thing I might point out. Throughout history, human mouths have proclaimed that material possessions are not the ultimate basis of pleasure in life, nor an adequate foundation for one's existence. This sentiment apparently comes from what-philosophers and what-religious leaders; it permeates the known history of humanity. The people who say it don't understand it. Consider this: it is just a prime example of Life stating the obvious through Man's mouth. Man says it, but it is of no consequence because Life already owns everything anyway. Someone recently wrote me a note using the phrase "live and learn." Although I have mentioned this to you before in passing, let me reemphasize a hard fact, a physical law behind this idea of "live and learn." At the what-person level, the concept of live and learn does not exist. Not in the sense of people undergoing some great change, not in the sense of people out in Life "pulling themselves by their own bootstraps" into some great state of higher consciousness just through the ordinary processes that take place. People will never, through ordinary means, ascertain what's going on; they will never achieve an understanding of what Life's memory may be and discover how they might change their position. One reason that "live and learn" doesn't work is that Real lessons cannot be put into words. Hence, Man cannot sit around and properly discuss lessons well learned. Anything that the ordinary circuitry can sit around and talk about on the basis of, "Well, so and so happened to me but 'live and learn'," and then nod with a profound look on it's face, is not a lesson well learned. Anything that can really be learned cannot be put into words. Thus on the ordinary level, the concept of "live and learn" is fallacious. If you can describe what happened and what you learned from the experience, it was no lesson learned. It was just a part of the ordinary process of the transfer of energy. Can anyone see any connection between this and the idea of not telling yourself what you're up to? Or how about the fact that if you are describing what you are doing, you are no longer doing it? And how about, down at the what-person level, the almost irrepressible need to tell people what you've learned? There is another way to consider the Straight Line phenomenon, this inherent ability of human circuitry to believe that things can go in a straight line. If you can observe it properly, ordinary consciousness always moves until it seems to get to the end of a line. The internal voices that seem to come from the Yellow Circuit itself, the ones that seem to be able to analyze problems, or think about world situations, always seem to run until they reach a conclusion. It's like they run until they reach the end of a page and then they stop. For Line-level consciousness, a map is useless unless it has an edge to it. If you are using a road map to find a certain city, you look for the road that you are on, then you follow that road, that line on the map until it comes to the point where the city is located. The line on the map is useful only when it ends. Life is moving through the highest extremes of humanity, where the Yellow Circuit is now. That is where Life is most active. But the Yellow Circuit's operation is such that there must be an end to each line. Were this not so, there would be no scientific information, no technology, no one could give directions or instructions; so-called knowledge would not be passing from one person to another were it not for facts, for conclusions, for sentences, for the thought processes themselves coming to some reasonable finality. This is tied directly to the illusion of the straight line. It is the epitome of man's abilities, but simultaneously, it is the manifest expression of his consciousness's limitations. Even if a series of lines seem to be connected in some way, they consist of a series of sentences, a series of periods. Anything Man has done that could be called progress, by any definition, is based on the ability of the Yellow Circuit to operate and form apparent conclusions. Without this, there would be no such thing as physical laws. There would be no such thing as transfer of information from one generation to another. But this is also the Yellow Circuit's greatest limitation, and ordinary consciousness cannot see this because it has nothing to compare it to. This property of consciousness -- of stopping at an apparent end of a line -- is also what keeps consciousness from expanding. Because as long as you are content to stop at the end of the page, you are back playing with the ants and their giant map. You can keep making the map larger and larger until it is as large as the place you are trying to describe, but then what have you got? Are you going to keep searching for a swami or religious teacher who has a system that keeps expanding and expanding until it is the same size as Life itself? Then where are you going to live? Are you going to live on the map or are you going back into Life? Or is it too late for that? Or could you even tell the difference if the map and Life become the same size? You start off with a scale of one inch equals one foot, but you decide that's not appropriate for the place you are trying to describe so you make the map bigger, and more detailed, and bigger still until finally it is the perfect map, an exact detailing of the place in question. It is no longer a scale rendering which represents something larger, something slower, or even something smaller and faster. The map is now in the same scale and speed as that which it represents. Now, that's a map! In a sense what I am doing with This Thing is making and expanding maps, but the maps I make do not have edges. I know you keep thinking they do. I keep folding in a different way, then I unfold a portion, and you see the place you thought you were going really doesn't exist in the way you thought it did. Don't worry about it because there is something else in that general neighborhood. What you are attempting to do, what anyone who is attempting This Thing at any time throughout Man's history was trying to do, is find your way in an area where ordinary maps are useless. But it can never be too drastic. If I had tried to tell you when I first met you the sorts of things I'm telling you now, it wouldn't have worked. You simply couldn't have heard what I was telling you. The things I say sound like ordinary terminology; I keep using examples that sound as if they have to do with everyday life and the nature of humanity. But this is truly an area, once you begin to see it, wherein any commonly available map is useless. It seems as though my maps are connected to everything else, which in a sense they are, but the connection is not as obvious and mundane as your Yellow Circuit wants to believe. In this uncharted area, your old, life-induced maps are indeed useless. The more they seem to be based on the ways in which you would ordinarily orient yourself, the more useless they are. When you continue to orient yourself using your old maps, you are just wasting time. I give you encouragement from time to time, and things seem to happen here and there to give you a little spurt, but anything you hear or see, or think you hear or see which is truly new and astounding remains nameless. While this is going on, you drag along this map I have given you. You have a piece of a new map, but you've still got your old outline of consciousness and you're still partially orienting yourself by the old maps. And for a time, that's just the way it is; it can't be helped. I am pointing out to you that to the same degree you allow yourself to be oriented by the old maps, to that degree you are wasting time. Your voices say, "Yes, I see it now. That's really food for thought." But at the same time, the circuits are running the old maps and are attempting to apply the new information to things you had heard or thought before. You're wasting time because in the area in which you are attempting to move, none of the old maps are of any use whatsoever. Those maps exist back down at the what-person level, and you do not lose them, you do not lose the ability to find your way across the street, to get a job, to go home and see your parents on Thanksgiving Day. You can still do all those things, but the what-person in your ordinary circuitry does not need further orientation. It does not need any further maps. It knew, it saw, it was aware of everything it needed back when you were 18 or 19 years old. Everything it has learned after then has been nothing more than pouring chocolate syrup on a sundae. Since that time, there has been nothing new for you, unless you consider butterscotch something new. There is a certain way in which you should start to see this, and not only from the standpoint of feeling a great sense of relief, which many of you have already felt. You should feel what a great responsibility it is to begin to truly understand that everything is new. Everything. Everything is a manifestation of the Three Flows, and the way your circuits see it is in a binary fashion. Every argument seems to have two sides. It is a never-ending stream of bipartisan antagonism and criticism. What a relief to see it for what it is, but what a responsibility, too. This is what few of you have gotten to yet, and I don't mean that in some somber, negative way. But what a responsibility it is to truly begin to understand that everything is true. One religious group attacks another, one nation attacks another, and in your circuitry something vibrates and responds to the ongoing criticism and conflict and accepts their complaints as truth: "I agree, nation X should not be allowed to take advantage of nation Y's economic woes." But both apparent sides of the conflict are right. It's all true. There is no rationale for it, it's simply all true. It sounds so theoretical until you acquire a little more information on your own, until you collect a few more observations on your own. Then, the worst thing you ever heard anyone say to someone else becomes true. The most despicable voice you have ever heard in yourself criticizing or speaking hatefully toward some group or individual, spoke the truth. There is no way to back up and find where you picked up that great prejudice toward some other race or religion, there is no way to go back and analyze the times you felt you hated your mother and then felt guilty about it. In the Trilateral world, there is no such thing as an untrue statement. There is no such thing as an unfair accusation. It's all true, every bit of it. When you get a little bit better you'll see that it's not really even a matter of everything being true. Remember, I told you that things cannot support any leg of a triad. Words are being used as a vessel, like a ship being used to transport something. The ship is a thing, and as such is not true. It is part of the process of something moving, and to that extent it is true. But the words people say to one another, like the ship, are simply irrelevant. What is true is that energy is being moved. After that first burst of relief comes the responsibility, because you can no longer play. (Not because of some moral standard. And I don't have to tell you at the time it happens, but I'm telling you now.) The responsibility is not some act on your part. It's not that you have to play some game when you get around me or around the group here, and watch everything you do and say lest you fail to act "responsibly." Some of you do feel that you have to watch everything you say around here, which is fine, but I don't say anything to you about it so don't blame me. Still, many of you, quite properly, quite understandably, quite predictably lapse into being what-people. Here at our meetings or when we get together at our more social gatherings, I see it come out in you. I can see it, I can hear it going on inside you. You are having to bite you tongue, having to watch everything you say. But that is not responsibility. That is getting close, it is getting up to it. But it becomes responsibility only when it is no longer an act. Here is something else for your Neuralizing pleasure. To talk about this, as usual, I'm having to isolate reality, to kill it and cut off a piece and talk about it, so listen fast. The closer things are to the Red Circuit, the more a man must "mean what he says." By Red Circuit, I could be referring to your system and also pointing down the line of time into Man's past. They're both the same and one springs from the other. A good example of this Red Circuit need to verbally "mean what you say" is depicted in your typical cowboy movie. The scene I have in mind involves Red Circuit people involved in a "good guy" versus "bad guy" confrontation. In the midst of a long, drawn-out feud, the bad guys have kidnapped the hero's girlfriend, and the good guys have captured the villain's kid brother. And as the movie heads toward the climactic showdown at the not-so-OK corral, the two opposing groups decide to exchange hostages. So in the middle of a film filled with every sort of violence and hostility, the head good guy and the head villain agree to walk out unarmed and discuss how the captured people will be released. I used this movie because I can change the structure around and it can seem to be a less personal example to you, but it makes a good example too because the story depicts something that is true far beyond the script that some apparent who-person wrote. That is, the closer people are to having their center of balance located more in the Red Circuit, the more they are inclined to mean what they say, and the more they are likely to get down to discussing exact details in the briefest of manners. The two groups in my movie example were trying to kill one another -- ambushes, the most dastardly tricks were quite acceptable to them -- at least, to the bad guys. Then suddenly both sides were willing to walk out unarmed and discuss things: "You send out my brother and I'll let your girlfriend go at the same time." "OK, the whole feud is off until they are safely across and behind cover." The movie depicts quite correctly that when it gets down to a certain proximity to the Red Circuit, even verbally, on the survival level, things must be concise, exact, brief, and you must "mean what you say." It's not just gunfighters in the movies. Carpenters have to be able to say, "Cut me one eight and a quarter," and the other carpenters have to know what he means. This does not mean that mechanical talk does not go on at this level too, but there has to be something else happening, a very precise, very brief form of communication, which from a broader viewpoint might seem rather antithetical to the Red Circuit under certain conditions. If you can expand this, I am going to tie it to something a little more pertinent; up the stakes a little. This is already happening to some degree in humanity but you must force it through your own circuitry. It is a fact now that words in and of themselves have become deeds and they speak for themselves; and not just in some figurative sense. It is the common perception that Red Circuit acts are deeds and that words are somehow different, that deeds are deeds and words are just talk. I'm not by any means putting a period on this for you, but it is more and more true out in Life that words have become deeds. You can make use this fact. I mentioned recently that you must become responsible for the blood flow into your Yellow Circuit. Well, words are part of the blood of the Yellow Circuit, and you must assume that, for you, words are deeds. A word is a deed, because it is. It's already true out in Life, ordinary people are just slow picking it up. Well, they are not really slow at picking it up, it's just that they are operating at another level. Here's a variation of something else I mentioned, something I want to push you to Neuralize a little further. Operating at the ordinary level, entertaining your own voices and letting them speak for you, whether you do it overtly or silently, when you apparently praise or condemn another person, you are admitting that they have an illusionary power over you. When you are back at the ordinary level, you are a what-person while believing just the opposite. A what-person has nothing to compare itself with, so it treats other people as apparent who-people with all the rights and privileges of who-people, as though they were free willed, knowing what they were doing, knowing what they were going to say next. Any time you accept your voices, no matter what the conditions, no matter how praiseworthy or blameworthy they seem, anytime you apparently praise or condemn another person, you are admitting to an illusionary power. You're making them your superior. I started sneaking this in on you several months ago and hardly any of you saw any significance in it, and of course I didn't mean it in any two-dimensional sense, but I told you that after a certain point in your involvement with This Thing there is no available external standard by which you can judge yourself. It was not an excuse for you to do or believe any certain thing, nor was it a condemnation of ordinary humanity. It does not mean that you're suddenly better than other people. But if there is any sort of apparent, external standard that has any significance to you, that you are judging yourself by, you are living back in your ordinary circuits. You are back in your old outline. It's just a fact. Once you reach a certain point, you have no equal. Not in any two-dimensional sense; you are not superior to other people. But you have no equal, much less does anyone have authority over you, much less is anyone superior to you. And you've got to watch this. You've got to watch voices in you that believe otherwise. What I'm telling you has nothing to do with you having any sort of ordinary superiority over others, but it does have to do with being trapped in the Grid. Any time you praise or condemn another human being, you can be assured that you are trapped in your old particular spot and you're transferring the kinds of energy that you were structured to. You submit to their authority, you admit that they are superior to you. And this leads, as it is supposed to, to very useless consequences. I'll tell you this in advance, so you can Neuralize it as you try to unfold and construct your own maps: there is no one in Life to praise. That doesn't mean you shouldn't be able to enjoy someone's music, or something they painted or whatever; it's got nothing to do with that. But anytime there seems to be an emotional feeling, an ordinary feeling of praising someone else, "Oh, how great they are, how I'd love to meet them!" Or, "How I'd love to be them," -- you're back down at Line level. You're back being a what-person, wishing you had changed pants with another what-person. You believe that if you could change pants with this other person, you'd be happier. You're back believing that if you had on his suit, it would create a new triad. Remember, reputations are things. You're back submitting yourself to an illusionary authority. Of course I usually try to get you to Neuralize this from the aspect that you can't condemn and criticize people, but praising them is the same thing. It's exactly the same thing as condemning them. There is nothing to praise in other people. You can enjoy what they do, but if you're listening to your voices which want to praise or condemn them, you are submitting yourself to an illusionary authority which is unnecessary. Unless of course you are ordinary. Another way you can consider this, if you can stick it together quickly enough, is: you cannot join in celebrations of anger, guilt, or failure, whether they be yours or someone else's. This is the nature of Life. If we take what I was just telling you about praising and condemning people and take it down a side street, you can see that throughout history and throughout all forms of human interaction, there is a continual, unrecognized celebration of these intermingled holidays -- either celebrating anger, guilt, or failure. You cannot join in these celebrations. You can't escape them if you are going to remain in Life, you will be amongst them and to some degree they will be affecting you. Somebody from one of the parties will bump into you, confetti will fall, someone will squirt a bottle of champagne on you, the words of their songs will leak through the walls of your apartment, but you cannot join in. They are all regressive. If there were a god in the sense that it is believed on the ordinary level, these celebrations would be the height of ungodliness, and yet these very celebrations go by the name of religious holidays. They go on under the name of goodness, progress, humanitarianism, religion. There are overlapping variations but they are three types: anger, guilt, failure. But you can't join in. If you do, then you are subject to them. If you do, then you are admitting, "I belong here." If you do, then you are transferring the kind of energy that either makes you feel angry, guilty, or frustrated in failure, because you cannot join in these celebrations without joining in these celebrations. You cannot celebrate anger, guilt or failure unless you have on the right party hat, and you had on the right party hat before you met me. You had on the right party hat almost before you were born. When you have on the right hat you know where the right parties are. Whether you find them in person or on TV, you find them and then you celebrate. But don't believe you're doing anything worthwhile, don't believe you're making some kind of progress. For there is nothing to celebrate. It's all regressive, it's all repressive, it's all a manifestation of the D Flow. Someone wrote me a note recently that concerned a situation they had observed wherein two people were apparently operating simultaneously as manifestations of the D Flow. The person who wrote the note was asking me about this from the basis of some of my earlier comments concerning the balance of forces in any given situation requiring two forces to always be present, with the third force hidden in the background. As I'm choosing to interpret it tonight, their question dealt with how one force could apparently serve two active roles in a situation. There could be instances wherein you thought that you observed such a thing, and I am not going to tell you absolutely whether or not such a thing could happen, that two people could both play a D role in a relationship. I am limited to words in telling you this, I'm limited to the part of the tempo spectrum in which words will work, but even if you thought you observed it, if such a thing was remotely possible, it would be on the basis that the two manifestations of the force would instantaneously cancel each other out. Can any of you remember the description I gave you of reversing the flow on somebody, of taking someone who was hostile to you or leaned on you in some way, and treating them exactly the way they treat you? Those of you who gave it the slightest amount of effort found out the descriptions I gave you were absolutely correct. Somebody could have been around you for months, years, giving you that same dose of hostility every day. And all you had to do was just give them even a crude imitation of that same behavior back, and, as I described it, you reversed a kind of current flowing between them and you. You turned it on them and it shut them off. The two manifestations, their mechanical one and your willful one, cancelled each other out instantly. Triads, things that exist and live in some observable scale and tempo, cannot be made up of legs wherein more than one leg is of the same force, the same flow. If it happened, it would be a phenomenon operating at such a tempo or scale that ordinary consciousness would not perceive it. That was what I was trying to hint to you when I said that the two manifestations would instantly cancel one another out. At the ordinary level, you would not even see it. Let's play along with this a little further (think how insane and drastic this would appear to ordinary people, to point out that something is absolutely impossible, then go ahead and talk about it). If you could take two people, both apparently motivated by equal amounts of the same force, and push them into each other, if they did confront one another, it would be almost as if nothing happened. They just wouldn't be aware that anything occurred. The person in question does not remember what happened the day you reversed the current on them. They walked in and started their little routine, transferring a certain kind of energy, celebrating their habitual holiday with you, and you turned and gave them back exactly what they were putting out, and now that person does not have any memory of what happened. To them, it's almost a blank. They do not, I assure you, have any kind of memory of what you said. It's almost as though it never happened, but now they can never treat you the same way again.